Abholung auch im Westerwald/Hachenburg oder Versand möglich !!! 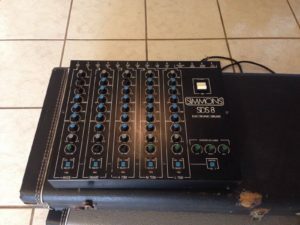 “For sale 1 SIMMONS SDS 200 Analog Drum Synthesizer . 100% analog . REAL GOOD FOR CLASIC ELECTRIC TOM TOM SOUNDS ! A GREAT INTRODUCTION TO WORKING WITH SYNTHESIS . Used but, still very solid . Cosmetically; she still looks very good. A few marks here and there with nothing major . “This is it people the sound behind the opening of Eastenders and the Pussycat Dolls’ “Don’t Cha” kick! This is the Moog of drum synths. This one is extra special because it has the Kenton MIDI retrofit. It’s the last one they sold and installed in 2002. The brain is clean and sounds great. Trigger it analog or via MIDI to phatten up your acoustic sound a’la Dave Weckl “Chick Corea Electrik Band”” Auction ended. Click here to browse on eBay. 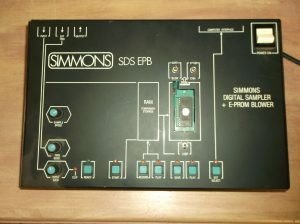 “I HAVE HERE A SIMMONS SDSV 4 CHANEL SOUND MODULE. IT DOES POWER UP AND TRIGGERS WORK, BUT I AM UNABLE TO TEST IT PROPERLY HENCE SELLING FOR SPARES OR REPAIR. SHOWS SOME WARE AS PHOTOS SHOW AND IS MISSING ONE RUBBER FOOT. COMES WITH POWER LEAD (NOT SHOWN).” Auction ended. Click here to browse on eBay. 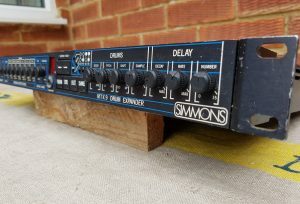 “vintage sds 1000 simmons drum brain. has sounds on it like the ones Alex used on “hot for teacher” !!! good working condition. not bad condition looks wise either. couple scratches and a little bit of old tape marks.” Auction ended. Click here to browse on eBay.